A successful coup usually requires two things: an acceptable leader-in-waiting, and a delegitimisation of the current leadership. While the PLP have only finally agreed on the former, the latter has been underway for some time. The latest delegitimisation of Corbyn’s position, and an attempt to legitimise the coup, is to claim the rulebook shows he will not make the ballot. It is expected among some the NEC will meet on Tuesday to deliberate the point, though this has yet to be confirmed. This question has quietly rumbled on for some time, occasionally being floated in the New Statesman or LabourList whenever the internal matters of the NEC or its elections are covered. But in the last two weeks the volume has been amplified, with Neil Kinnock claiming Corbyn would have to do as he did in 1988 and reseek nominations. In 1988, nomination papers were sent to all MPs, unions and CLPs automatically every year, with the election at annual conference, by an electoral college if it was contested. That system no longer exists. The rulebook has changed dramatically since 1988, several times, and suggesting there is precedent is pure misinformation. We have a new election system, and the rules on incumbent leaders seeking nominations has changed too. Precedent from 1988 only holds if we were using the 1988 rulebook – and we aren’t. Where there is no vacancy, nominations may be sought by potential challengers each year prior to the annual session of Party conference. In this case any nomination must be supported by 20 per cent of the combined Commons members of the PLP and members of the EPLP. Nominations not attaining this threshold shall be null and void. As it stands, the reading is not totally clear, but it is clear enough: to challenge the leader you collect nominations if your own, and nothing is said of the incumbent. But Corbyn’s position is even stronger than that. The rules were changed in 2007 precisely to prevent an incumbent needing to seek nominations. Until 1997 the incumbent collected nominations ahead of every party conference, and were they to be challenged, the challenger did the same. In 1997 Blair simply ordered that to cease. The rule change is clear. Where the incumbent previously required nominations (as Kinnock did in 1988), they now do not. Plain and simple, surely? Not so for the plotters. They are now claiming they will use their power on the NEC to attempt to get the ruling body to agree to force Corbyn to re-seek nominations. While it is always difficult to gauge what the NEC will do at a given time, in this case were they to rule against Corbyn it would be a blatant ignoring of the rulebook. Given the current balance of the NEC is finely in favour of Corbyn, it is a ruling he is likely to win, especially given Unite and UNISON statements of support in the last few days, and with the latter’s National Labour Link Committee voting on Friday to support Corbyn. Were the NEC to rule against Corbyn, the party may find itself falling foul of contract law, which governs all membership organisations. The party, just like any other membership organisation, cannot pick and choose which rules it follows. There are claims the party has its own contrary legal advice from GRM. But this advice has not been seen, nor is it clear who has commissioned it. Will the right-wing members of the NEC risk widening the rift with members, continuing to drag the party’s reputation through the mud, and land the party in court, all at huge cost? We’ll find out this week. With the old advisers of Blair and a few oligarchs of his creating funding the anti Corbyn move, I am dismayed that this buying of political power and favour has not been investigated by the police. Whilst it might be legal to offer finding for a campaign, is it legal to pay for a group to be able to destabilize a political party? An excellent summary of the legal position, but apart from this it would surely be counterproductive of the Eagle camp to attempt to exclude Corbyn from the ballot, ie requiring him to obtain nominations. Many fair minded members who might otherwise have opposed Corbyn would see this as grossly unfair and might alter their allegiance accordingly. Peter Edwards (not a Corbyn supporter) on Labour List has recognised this. They won’t exclude him. They will simply tie him up in challenge after challenge after challenge. Doesn’t it say They only do it once a year. Does Jeremy continue as leader through the leadership challenge or does Tom Watson take over as deputy leader? A really useful article, James. It looks as if Jeremy is on very solid ground – and that all that guff from Kinnock and co (and the entire media) about “the precedent” set by his 1988 contest is utterly irrelevant. Good , clear, explanation by you. As I’ve said previously, the clearest indication of the weakness of the coup plotters legal advice is that they had to spend two weeks fruitlessly trying to bully Jeremy into resigning. They must know themselves that this really isn’t a good look, and how Party members (even those who are not Corbyn supporters or who voted for him last time) feel about how wrong and nasty their actions have been, but they had to try this as otherwise they know full well that regardless of any NEC decision the likelihood is that the High Court (if needed) will rule in favour of the very obvious interpretation of the current rule and that nominations only apply to challengers to a sitting leader. The coup plotters are very weak, they have overplayed their hand at every stage, but particularly since the central aim of the coup to force a resignation failed. 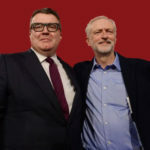 Tom Watson who was once seen as a fixer in inter party-union relations is now seen as a dishonest problem. How they can get themselves out of the very deep hole they have dug remains to be seen, particularly as it is now clear the Tory Party are not going to split now it will be a May coronation – a few may still wish to re-run a SDP-style merge with the Lib-Dims, the rest for all their noise will be feeling very uncomfortable indeed now, not least as they themselves have opened the very real and urgent need for both targeted reselections and a mandatory reselection rule change. They don’t care if it is a good look or not. They are playing Russian Roulette with the continued existence of the party. Sack Corbyn and elect a leader acceptable to the PLP or we sink the party through endless pointless challenges. You are perfectly right, these Blairites will not stop now or ever, they will go on and on, but essentially we need the removal by deselection of the main protagonists. Then see how the land lies. Whilst the remainder will soften they of course will carry on but with more subtlety, playing down rather than supporting, that will then fall on Local Parties to re-select candidates that are Labour not Neo-Liberal Tory. This could take some time but in the meantime, we now have a sound shadow cabinet working with Jeremy not against him, that will also start to effect support in the country. The longer time goes on the more these coup plotters will fall by the wayside. It is clear to me THERE IS NO VACANCY! But if they keep JC off the ballot paper by hook or by crook (and tomorrow’s NEC decision is crucial) and if the 174 in effect ‘deselect the Leader’ above the heads of members then there should be immediate re-selection meetings (of those who select them in the first place and those who make the party work and leaflet and knock on doors in all weathers) for the 174 WHAT’S GOOD FOR THE GOOSE IS GOOD FOR THE GANDER. Perhaps we should do this anyway and clear out the Augean Stables. And I have seen so many talented and diverse working class and progressive middle class men and women at Pro-Corbyn rallies who would do a better job (and as definitely no Maoist) there does seem to be thousands of flowers blooming! Wonder what the Tories are waiting for and do they need the chance to carry out the boundary changes to gain some advantage? They will present May as a one nation Tory to try to CON the masses but hopefully the Masque of Pandora will slip and to draw from Chomsky the only one nation they believe in is the one nation where 1% own 90% of the wealth, the next 15% do well and spend their time explaining to us why the 1% should have all this, and the remaining 84% get the crumbs! There should be an election for deputy leader. Watson has proven that he is not fit for purpose for this role and should be challenged. Hello, Clive Lewis.